The podcast 99% Invisible had a story about weather control. That story inspired the following. Weather control is an attractive idea. Warmth when we want it; rain when we need it. Light wind? Sure. No snow? Why not. The 19th century’s Industrial Revolution led many to believe that if we could control and increase production so efficiently, why can’t we control nature, too? Beyond the ceremonial rain dance. Beyond prayer and sacrifices to the gods. During the American Civil War, some thought that its large battles had affected the weather and the idea of shooting cannons, setting off fireworks, exploding hydrogen balloons might cause rain. The US Department of Agriculture experimented with this idea in Texas in the 1890s. It worked since it rained, but some suggested that it rained because it was the rainy season in Texas anyway. Sporadic attempts continued with no actual success. 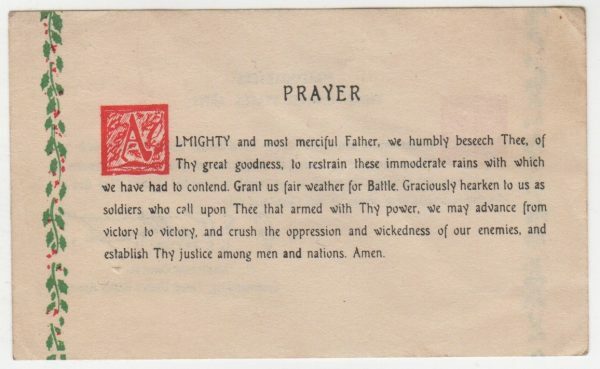 Like the impact of the Industrial Revolution, the development of the atomic bomb again led us to feel we had conquered the unconquerable and renewed the idea of weather control. 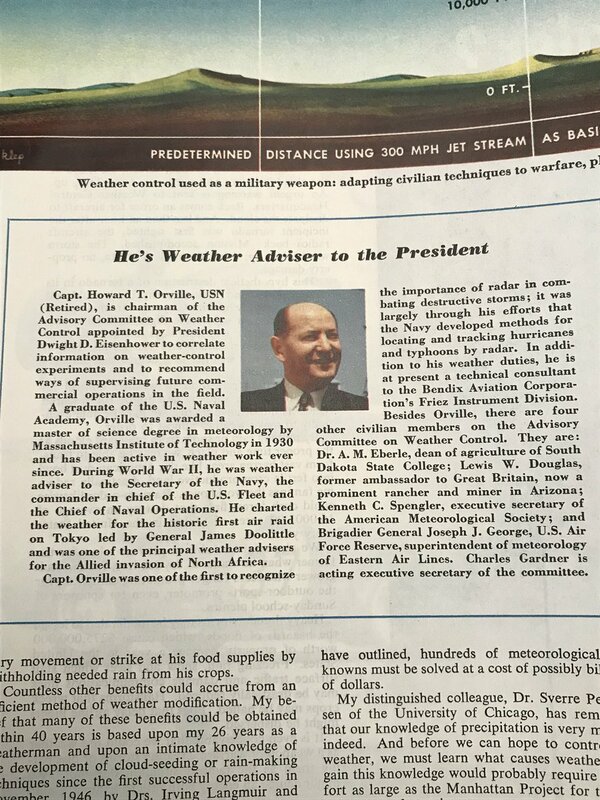 So before the so-called Space Race of the 1960s, the US joined the Weather Race. Communism had arrived and the Cold War was around the corner. Of course, the race wasn’t just for a gold medal to the winner of weather control. The military advantages were immense. In July 1946, Irving Langmuir, the 1932 Nobel Prize in Chemistry awardee, and his assistant Vincent Schaefer discovered that moisture that normally stayed vaporous below freezing, would turn into ice crystals when they super-cooled it with dry ice. And on November 13 of that year at the General Electric Research Laboratory in Schenectady, New York Langmuir, and Bernard Vonnegut discovered that silver iodide could be used with dry ice as a nucleating agent to seed clouds. Seeding clouds involved inserting large quantities of a nucleating agent into clouds to facilitate the formation of ice crystals. The intent of this process was to cause the clouds to produce rain or snow. Side note: Langmuir was the inspiration for Bernard’s brother Kurt Vonnegut’s fictional scientist Dr. Felix Hoenikker in the novel Cat’s Cradle. The character’s invention of ice-nine eventually destroyed the world. Kurt had briefly worked at GE as well. While GE was initially interested in the science of weather control, the worry that chemically-induced snow storms causing damage and the likelihood of subsequent litigation persuaded them to curtail such research. “Rainmaking” or weather control can be as powerful a war weapon as the atom bomb, a Nobel prize winning physicist said today. 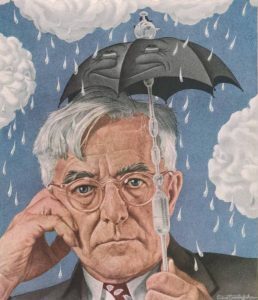 Dr. Irving Langmuir, pioneer in “rainmaking,” said the government should seize on the phenomenon of weather control as it did on atomic energy when Albert Einstein told the late President Roosevelt in 1939 of the potential power of an atom-splitting weapon. “In the amount of energy liberated, the effect of 30 milligrams of silver iodide under optimum conditions equals that of one atomic bomb,” Langmuir said. While further experimentation continued—Langmuir was particularly interested in neutering hurricanes (Project Cirrus in 1952)—none proved effective and critics pointed out that they could explain any proffered “proofs” with more logical and meteorological explanations. 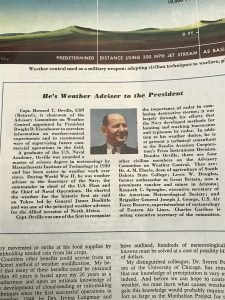 In August of 1953 the United States formed the President’s Advisory Committee on Weather Control. Its stated purpose was to determine the effectiveness of weather modification procedures and the extent to which the government should engage in such activities. Captain Howard T Orville chaired the committee. “It may someday be possible to cause torrents of rain over Russia by seeding clouds moving toward the Soviet Union. Or it may be possible — if an opposite effect is desired — to cause destructive droughts which dry up food crops by “overseeding” those same clouds. Despite the lack of concrete observable results, interest continued. 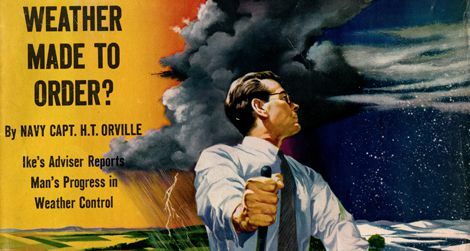 Project Stormfury began in 1956 and continued the attempt to control or mollify severe weather. “Behind the scenes, while statesmen argue policies and engineers build space satellites, other men are working day and night. They are quiet men, so little known to the public that the magnitude of their job, when you first hear of it, staggers the imagination. Their object is to control the weather and change the face of the world. Less than a year later, on May 27, 1962, Vice President Lyndon Baines Johnson presented the graduation address at his alma mater, Southwest Texas State University (today Texas State University) in San Marcos. Despite such pessimism, Project Popeye happened nonetheless. 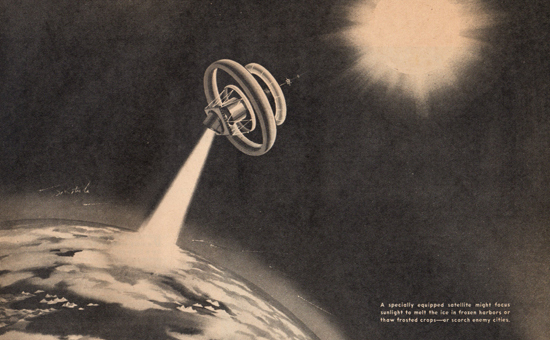 Due to the weak science and questionable results, the military kept the project secret. September 1, 1966: the Joint Chiefs of Staff granted approval of the project and issued the execute order on September 17, 1966. September 29 1966 — October 28 1966: the US military began Project Popeye in a strip of the Laos panhandle east of the Bolovens Plateau in the Se Kong River valley. Naval personnel eventually conducted 50 seeding cloud experiments. Project leaders claimed that 82% of the clouds produced rain within a brief period after having been seeded and that one of the clouds drifted across the Vietnam border and dropped nine inches of rain on a US special forces camp over a four hour period. March 20, 1967: a highly classified weather modification program in Southeast Asia called Operation Popeye began. It was an attempt to extend the monsoon season, specifically over areas of the Ho Chi Minh Trail maze. The military seeded the clouds over the Trail to create floods and wash out supply routes to hinder North Vietnam’s supply chain into and from South Vietnam. 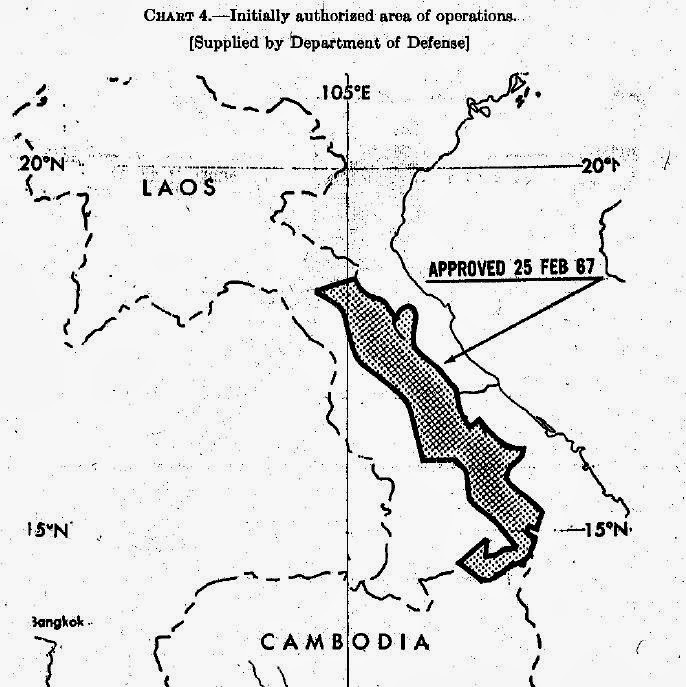 The initial area of operations was the eastern half of the Laotian panhandle. 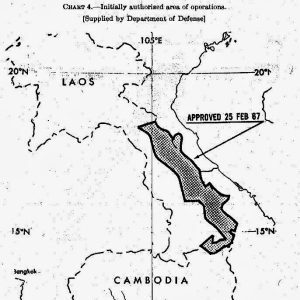 July 11, 1967: the Operation’s operational area was increased northward to around the area of the 20th parallel and included portions of far western North Vietnam. November 1, 1968: the southern region of North Vietnam was removed from the Operation concurrent with a halt to conventional bombing of North Vietnam. chairman of the Subcommittee on Oceans and the International Environment requested the Department of Defense to provide information with respect to the program. Also on the same day, a third NYT article stated: Two former high‐ranking officials of the Johnson Administration said…that Robert S. McNamara, while Secretary of Defense, specifically ordered the Air Force to stop all rainmaking late in 1967…. But other officials, who served in both the Johnson and Nixon Administrations, said they recalled no such clear‐cut order. It was not clear whether Mr. McNamara’s order was dis obeyed, ignored, or—as one of ficial suggested—“there was a kind of slippage” in putting it into effect. July 5, 1972: Operation Popeye ended. July 28, 1972: sponsored by Senators Gaylord Nelson of Wisconsin and Clairborne Pell, the US Senate voted for an amendment to cut off Defense Department funds for any use of rainmaking or creation of forest fires as a weapon of war. Pell’s Subcommittee with a top secret briefing on weather modification activities in Southeast Asia. 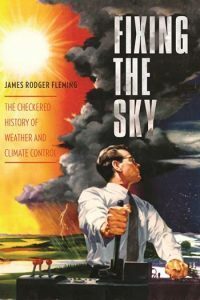 In September 2010, James Rodger Fleming published Fixing the Sky: The Checkered History of Weather and Climate Control. In it he wrote: Although some claimed that [Operation Popeye] induced from 1 to 7 inches of additional rainfall annually along the Ho Chi Minh Trail, no scientific data were collected to verify the claim. General Westmoreland thought there was “no appreciable increase” in rain from the project. Even if the cloud seeding had produced a tactical victory or two in Vietnam (it did not), the extreme secrecy surrounding the operation and the subsequent denials and stonewalling of Congress by the military resulted in a major strategic defeat for military weather modification. The expression that something is “the best thing since sliced bread” is one, I guess, that most people younger than Boomers do not recognize. Even for Boomers, it is an expression that they likely winced at when they heard a parent or grandparent use it. Until a Boomer, or anyone, tries to actually slice a piece of bread. And then other less polite expressions are spoken. Otto Frederick Rohwedder was born in Davenport, Iowa. His first profession was a jeweler, but he longed to be an inventor. He sold his jewelry stores to finance that dream. In 1917 a fire broke out in the factory where he was developing a machine to slice bread. Delayed but not dissuaded, ten years later he successfully developed a machine that both uniformly sliced and wrapped a loaf of bread. 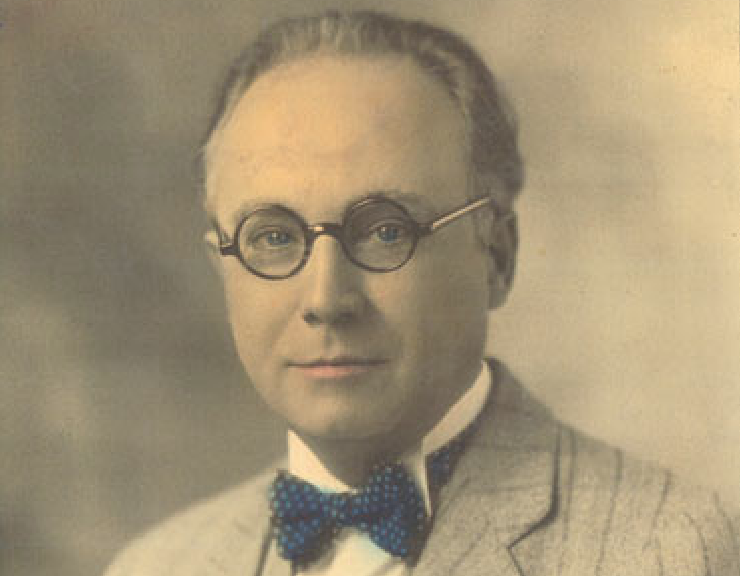 The Chillicothe Baking Company was the first to buy his machine and on July 7, 1928 (incidentally his 48th birthday), the company sold its first loaf of sliced bread. 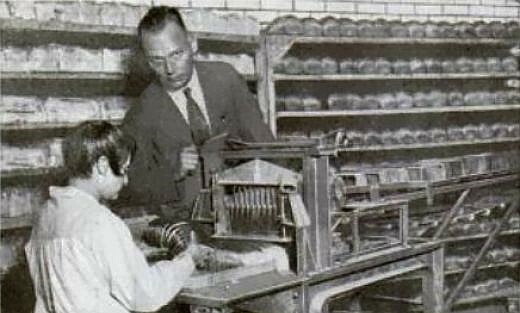 Sales of the machine to other bakeries increased and sliced bread became available across the country. Of course, toast was part of American breakfasts already, but with the easy availability of sliced bread, toast became more and more popular and that demand led to an increase in the sale of, what else, toasters. While Wonder Bread may have come to be associated with over-commercialized and less nutritious food, in 1930 the Continental Baking Company introduced its sliced bread. Other companies followed, eager to find the same success as Continental’s. By 1933 American bakeries produced more sliced than unsliced bread loaves. 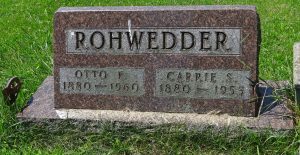 Rohwedder died in Concord, Michigan on November 8, 1960. He was buried at Riverside Cemetery in Albion. “Tiny Blue Transistor Radio” by Connie Smith. In the Exhibition Gallery of the Museum at Bethel Woods Center for the Arts is a display of sleeves for 45 rpm record and several transistor radios. On a tour that includes a young guest, I will ask them whether they know what they are–either of them. 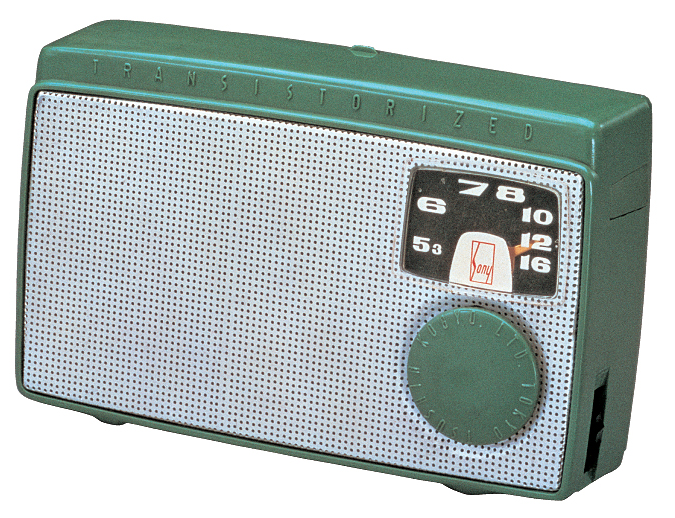 In an obtuse way, I kiddingly refer to these radios as PLDs…Personal Listening Devices. The term my attempt at re-naming a product with a 21st century twist. To that same young guest, I will ask them if they have a cell phone. Depending on the age they will nod “Yes” with a smile or “No” longingly. I ask those without one how old is someone now when they get their first cell phone? The answers vary, but by the age of 10, cell-phone ownership is common. The transistor radio was not the first “PLD.” Tubed radios with large batteries existed, but were too heavy and bulky to actually be considered portable. They could be moved and put in a different place, but hanging out with friends at the park with one was simply too difficult. The transistor radio changed all that. The transistor itself had been successfully developed by Bell labs in the mid-1940s [Wired article] As with any new invention, some scientists looked for other uses. 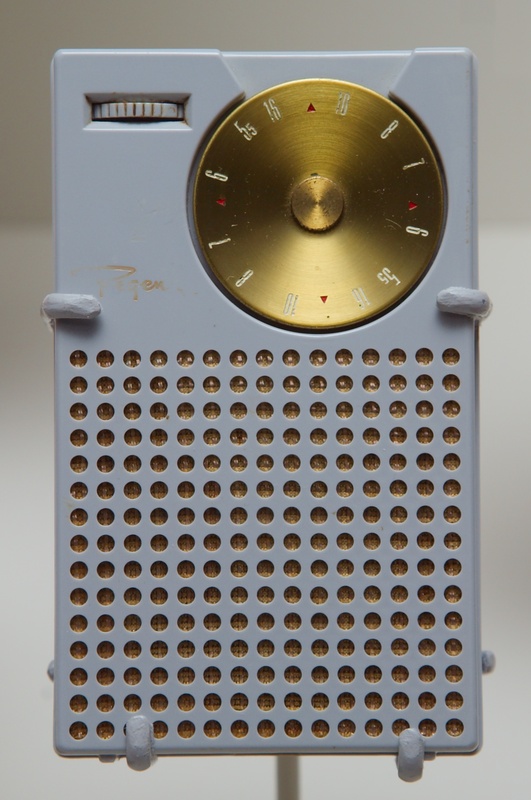 On June 30, 1948 Bell Labs held a news conference at which they demonstrated a prototype transistor radio. A prototype is not a commercial product and it was still six years before a commercially viable transistor radio arrived. Two companies working together, Texas Instruments of Dallas, Texas [site] and Industrial Development Engineering Associates (I.D.E.A.) 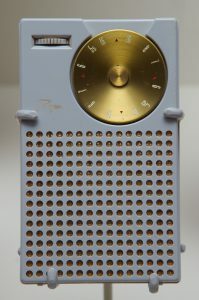 of Indianapolis, Indiana, were behind the unveiling of the Regency TR-1, the world’s first commercially produced transistor radio. They made the announcement on October 18, 1954 and sales began in November. It cost $49.95, not inexpensive. Competition and development brought down the cost, though one could never describe even the least expensive models as cheap. Transistor radio untied Boomer teenagers from their parent’s kitchen radio and their parent’s nearby ears. Boomers could listen to their music (at first only on AM radio) with their friends (or alone), wherever they wanted. And as long as you had a wet tongue, you could test whether that 9-volt battery had any life left!